Sadly, due to a misunderstanding, the above book was republished as if the author was Dr Andrew A. Bonar, the well-known brother of Dr Horatius Bonar. Since the book was reprinted, it had been ascertained that it is, in fact, the work of a different gentleman, who has the same name and shared similar convictions concerning prophetic truth. The Council of the Sovereign Grace Advent Testimony sincerely apologises for any confusion which may have been caused. However, it has to be acknowledged that the value of the book lies in the truth it promotes rather than in the personality of the author. (Published by the Sovereign Grace Advent Testimony in 1998). Critical, Devotional and Prophetical: with the Text of the Authorised Version, Metrically Arranged, according to the Original Hebrew. "A second-advent interpreter, and one of the best of his class. Highly esteemed..." was the verdict of Charles Haddon Spurgeon, in his Commenting and Commentaries. 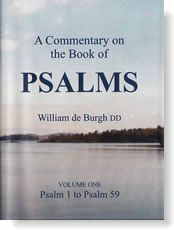 Indeed, he uses several quotes from William De Burgh in his own treatise on the Psalms - The Treasury of David. 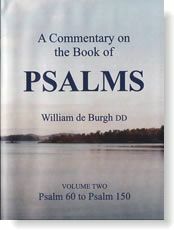 AR Fausset (of Jamieson, Fausset and Brown] also refers to 'his valuable commentary on the Psalms'.